With TeacherVUE™ Mobile, now you can access and manage your classroom from anywhere using your iOS device. Mobile, real-time access to your school’s Synergy student information system allows you to take attendance, view student demographics, schedules, emergency contacts and more from your iOS device. Especially great for teachers that require mobility (ex: field trips, physical education classes) and for administrative staff, coaches and hall monitors that need to verify student identity by photo anywhere on or off campus. The TeacherVUE™ Mobile application provides the same user experience as the web-based TeacherVUE module. Requirements: • Only school districts using the Synergy student information system version 6.5.1 and higher can support the TeacherVUE Mobile application. Requires configuration of Synergy SIS by school district’s system administrator. • Requires wireless or 3G Internet connection. 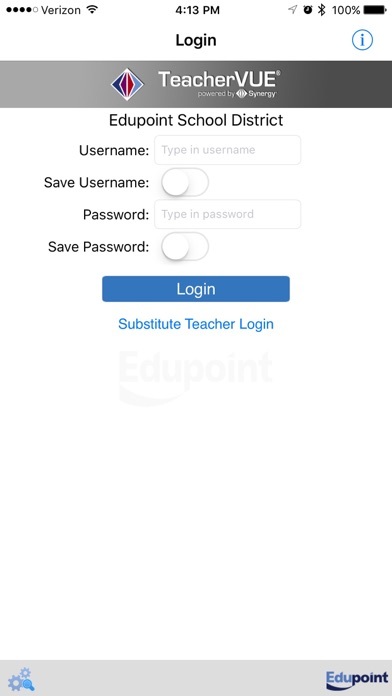 • The TeacherVUE Mobile iPad app uses same user login as web-based TeacherVUE portal. Please contact your School District’s Administration office to verify Synergy™ version and login information. Useless. Doesn’t work with the iPhone X. I got tired of deleting and adding. I give up. I was hoping after I finally got in, because finding your schools synergy url is not easy to find that I would be able to input grades quickly on the app, nope! If they could update this where we can access the gradebook and and enter assignments and grades on the app this app would be useful and totally worth the time to find the school’s url, but right now it’s useless app. I am going to see if I on a school day I can at least take attendance on it but I highly doubt it. Very disappointed teacher! Given how poor Synergy support is, I am not surprised that the app is unusable. Constant crashes on iPad. Website also does not perform properly on iPad. Missing Schoolloop! This app crashes as soon as you open it. Used to work for taking attendance, but would love to be able to use it for grades. This app is a testament to the state of public teaching. I was hoping to open it up to give a quick daily work grade while I was on the go. After spending ten minutes of researching how to login (You need your school district’s url, but it’s a synergy version of your school districts url. Seriously, why is there not a drop down menu? ), I found out that it doesn’t even let you access the grade book. I have no idea what any teacher would use this app for—looking at their class rosters maybe? Still can’t use this app. I used to love this app. Now it crashes about 1.5 seconds after trying to open it. I’ve tried deleting and restoring on phone from cloud to no avail. Serious issues. iPhone Xr if that makes a difference.... three months of continuous crashing. I dropped this app after numerous crashes. When trying to contact them I received no responses. I would love to see my district move away from this. Read the other reviews, I have nothing new to offer. App will crash on anything with FaceID. For everything else (with TouchID) app appears to function, but when attendance data is recorded it doesn’t reach the server (oddly enough it works fine for my co-worker who has the iPad I do). What a waste of time, effort and money. Please update! I can’t even open the app - this is a bit frustrating. When this app first came out I really enjoyed it. I would mainly using it for taking attendance when I was on the go. Now, it just crashes all the time. Sometimes I can’t even get it to open. I’ve tried deleting and installing it again. It works for a little bit but crashes again. There’s to many bugs in it right now. Hopefully, the developers can fix it and possible add additional features in the near future. Please fix and update! I use to love this app, until about three weeks ago. The app will open and then just crashes. Don’t waste your time till they post an update and fix. When enabling “Touch ID” (which is Face ID on this newer iPad) the app no longer opens. It just crashes. The Face ID works with this app on my iPhone XS Max but I cannot get it to work on the new iPad. Can we get this fixed? It will only work for the first open after installation. Once you exit and try to go back to use the app, it will crash. Not worth the hassle. Continues to crash on my iPad. Needs some updating. For the money our district spends this should work. Love the idea of this app. It’s actual execution however is a big flop. The app crashes all the time. The only way to fix this is to delete and reinstall which as a teacher is near impossible during the work day. They need to work out the bugs in this app big time. App does not load after last update on my iPhoneXR! This appears to a problem that’s been noted multiple times since September! Did the app please! Taking attendance on iPad or phones, referring discipline, seeing snapshot of StudentVUE- there are many user friendly features that make TeacherVUE a favorite. I have to uninstall and reinstall the app anytime I want get it to open. Worked fine on iPhone 6s, but not on new phone. Might be understandable for a few weeks following a new device release, but after a few months?!?? C’mon! App can’t access class rosters anymore. Tried deleting and reinstalling with no success. App is useless with access to rosters for attendance. The likelihood this app is going to work appears to depend entirely on the day of the week 🙄 Additionally, as soon as I upgraded to iPhone X, the app crashes constantly upon opening. Useless! I turned on the FaceID login feature and it caused the app to crash every time I open it. I had to delete the app completely and reinstall it to get it to work. Don’t toggle on Face ID and the app will work fine. This app is useful when looking up student information. But other than that it’s useless. I really need it to be able to have the communication feature like the web version. I need to be able to email all parents at the same time or just one parent. For the last month the app has not worked and sends an error message. Was told it would be fixed by 9/28. However, I and other teachers are still receiving this message. 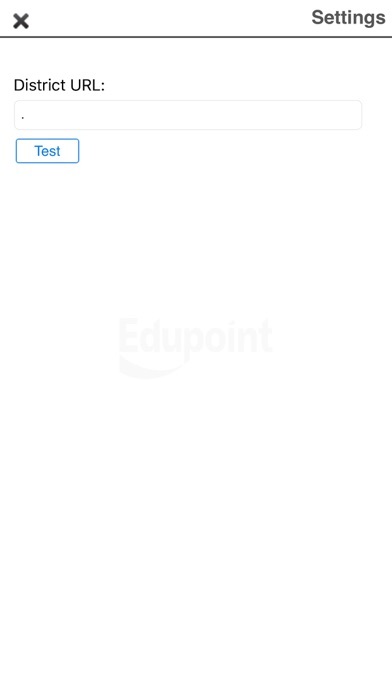 On my iPhone XS, the TeacherVue app crashes at launch every time after my initial set-up. The only fix is to delete the app, reinstall, and set everything up again. I used to love this app! It was so convenient to take attendance on my phone. However, for the past few weeks NO ONE in my county has been able to access their class rosters to take attendance. If it doesn’t start working within the next week, I’m deleting it from my phone. There is no sense in wasting space on my phone with an app that doesn’t work. Great idea. Concept fantastic. Reality is, it crashes several times a day and I have to download the app and re enter all the links to make this app work. It works for half a day and repeat. I’ve abandoned teacher vue. The app is broken and needs an update. Please fix!!! I can’t even get past the “enter district URL” prompt. The laptop software is equally unreliable. The app crashes every time I attempt to open in. I have to delete the app and reinstall to get it to work again. I can’t do that 5 times a day while I’m trying to take attendance efficiently! I love the app when it works, but since it never works correctly it’s a total waste! By Mom needs to check behavior!! 🤷🏼‍♀️ Can’t even get to the login page. Encountering the following error daily while attempting to save attendance: “Object reference not set to an instance of an object.” Lunch count data appears to be saved but the count never makes it to our district server. Once the lunch count is saved on the device I open the lunch count again to find the data fields are blank. Agreed with other reviews. This would be useful if I could access my grade book and enter or adjust scores. It should just be called Teacher Attendance View. You can only do attendance / phone calls. Can’t even email. it feels like every week, other week, or even every time the app is updated that I start getting login failures and the only solution I have found is to reinstall the app. Aside from that it works great! Probably the most needed feature, being able to enter progress report grades, is not available on the mobile app. You can ONLY enter attendance. Why can’t this app allow us to enter grades?? It’s 2018, come on Synergy! When this app worked it was great! Now it shows an error code every time I open it and try to sign in. PLEASE FIX! What the app does is great. That being said the only thing that it does is take attendance. If it had a grade book function it would be fantastic. It’s nice to be able to take attendance and add notes while walking around the room- but that’s all the app is really used for. Kids can see their grades, I wish we could put them in while checking classwork. This would easily be 5 stars if I could access my grade book also. I teach woodworking and metalworking. I always take attendance in my room, but to be able to grade out in the shop without my laptop would be fantastic. No one is motivated to update any of their faulty software and program because of our district is not complaining. Going to pressure my district to drop synergy, they're the worst. Login failure ON THE DAILY. Who's sleeping on the job? I am 100% certain that my login and password info is correct, yet it still gives me an error. When it works, it's convenient. Would love to be able to put in grades!